Where to find Bolton-Ouest hotels near an airport? Where can I find hotels in Bolton-Ouest that are near tourist attractions? Are you planning to spend time in Eastern Townships? Hoping to book accommodation in Bolton-Ouest? Within a 0.1-kilometre (0.06-mile) distance of its central area, you can find 7 Expedia-listed hotels. The Motel Beaver Pond is nearest to the middle of Bolton-Ouest and the only option that is only a short drive away. 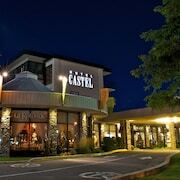 The Spa Eastman is positioned 13 kilometres (8 miles) from the middle of Bolton-Ouest. 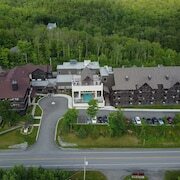 Alternatively, the Le St-Martin Bromont Hotel & Suites can be found 20 kilometres (13 miles) away. If you'd prefer, you could book a bed at the Hôtel Château-Bromont or the Hôtel Chéribourg. Venise-en-Quebec is 60 kilometres (36 miles) to the west of Bolton-Ouest and is where you'll find Venise-en-Quebec Beach and Missisquoi Bay Golf Club. Should you wish to visit Venise-en-Quebec, check out the Les Ailes de Lyne and Le Champlain. 30 kilometres (19 miles) to the northwest of Bolton-Ouest, you'll find Granby, home to the St Christophe Hotel & Spa, an Ascend Hotel Collection Member and Hôtel Castel & Spa Confort. If you're staying in Granby, set aside a little time to check out the Granby Zoo and Interpretive Nature Center of Lake Boivin. Get your fix of local sport by making a visit to Olympic Stadium, which is 95 kilometres (59 miles) to the west of Bolton-Ouest. 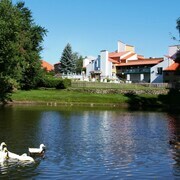 Book a hotel near the action at the Auberge de La Fontaine or the Loft Hotel. Burlington International Airport is a logical airport, and is 100 kilometres (63 miles) away from Bolton-Ouest. 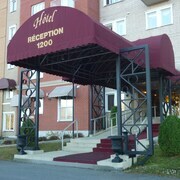 Conveniently located hotel options are Sonesta ES Suites Burlington VT and Courtyard by Marriott Burlington Williston. 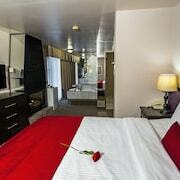 What are the most popular Bolton-Ouest hotels? Are there hotels in other cities near Bolton-Ouest? What other types of accommodations are available in Bolton-Ouest? Explore Bolton-Ouest with Expedia.ca’s Travel Guides to find the best flights, cars, holiday packages and more!